Alcacer do Sal is located in the plains of the Alentejo region in southern Portugal, and is one of the oldest cities in Europe dating back 5,000 years. Originally founded by the Phoenicians who set it up as a commercial colony for trade in the Mediterranean, there is evidence of previous habitation in this area going back 40,000 years to the Mesolithic period. Alcacer was occupied by many great powers such as the Romans and the Moors who made it the capital of the region. It was not until 1217 that Afonso II of Portugal gained control of it, and three centuries later it was here that Manuel I married the daughter of the King of Spain in 1500. During this period the slave trade played an important role in the town’s two largest industries which were the production of salt and rice. Today Portugal remains the largest producers and biggest consumers of rice per capita in Europe. Situated along the estuary of the Sado River, it is a prime location for bird watchers as there are over 100 different species. In fact one of the towns more unique features are the storks’ nests perched on the rooftops of the church. Alcacer do Sal has a particularly wonderful waterfront promenade that is lined with lovely cafes and restaurants, and a charming medieval quarter. 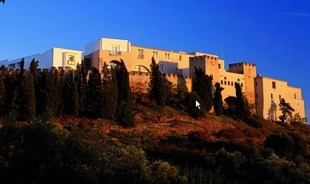 Set on the hillside stands an impressive castle built by the Moors, which has since been converted into the Pousada de Alcacer Sal Hotel Dom Afonso II. The Pousada not only has an excellent restaurant serving local and regional cuisine but a lovely outdoor pool and beautiful views of the surrounding countryside. Directly west of Alcacer is the entrance to the Troia Peninsula. The peninsula is best known for two things; miles of white sandy beaches and the Trioa Golf Course. The golf course is located at the northern end of the Peninsula and was designed by Robert Trent Jones Senior. For those who enjoy ancient history, there is also the intriguing ruins of the semi-submerged town of Cetobriga which was destroyed by a tidal wave during the 5th century. Excavations have revealed thermal spas and a temple decorated with frescoes. From the north end of the peninsula you can catch the ferry to Setubal, Portugal’s third largest port, which has retained its original charm in the old quarter with beautiful monuments, attractive squares and quaint cafes. There are also boat tours available to take you dolphin watching. More or less next door to Setubal is the Arrabida Nature, a protected park to with isolated chapels once used by Franciscan monks during the 16th and 19th centuries. There are only certain areas you are allowed to explore and you must be accompanied by an official guide. You can also visit the Fort of Nossa Senhora da Arrabida with an Oceanographic Museum providing information about the plant and wildlife. Beyond the reserve heading west is the small fishing village of Sesimbra that is famous for its excellent fish restaurants. In the old part of town stands a 17th century fort that overlooks the sea. Every afternoon the fishing boats come in and if you head down to the docks you can watch the fish auction that takes place each day. From Sesimbra you can also drive or take a short bus ride to Cabo Espichel. The cape was an important pilgrimage site many centuries ago, and has magnificent cliffs with stunning views of the coast. On Lagosteiros beach you will find some superb examples of dinosaur footprints. The Vale do Gaio dam is only 30 kilometres from Alcacer do Sal and has wonderful hiking and cycling trails. There is also an opportunity to hire a row boat, do some fishing, or even enjoy a horse-drawn carriage ride. Because the Sado Estuary is protected as well there are many designated nature trails with hides that allow you to observe the birds without disturbing them. You can follow these trails either on foot, bike, or horseback. The more adventurous can also try their hand scuba diving, hunting, shooting, fishing, and archery.